Day one started with a four mile trek towards Davenport to upload Sam’s interview and the SUP footage. It blew last night and the Red Bull tent was a little loose when I headed out with the wind to my back. After uploading the files and struggling against the wind back to the beach. It was clear the contest was a go. Needless to say when I got back the tent was gone, Well stacked around the Toterhome. Mat & Josh got to it and finished the single elimination side of the contest and the youth final. Bernd, Morgan and Nick put on a show to end the day wih Bernd winnig the youth class. Word is the wind is supposed to pick up tomorrow. All I can say is my hands did not get as numb as Pistol and the jumps were not as spectacular. All in all a great day and plenty of wind and waves for everyone to show off their stuff. The contest kicks into high gear tomorrow and the word is they want to get everyone home for mothers day. Great crowd the parking lot was full and just a ton of spectators. Day one a success and a great kick of for the American Windsurfing Tour’s 2011 campaign. Made it down to Waddle Beach Big Basin Redwoods State Park and caught the tail end of American Windsurfing Tour Director Sam Bitner getting Interviewed in the Toterhome. The swell is picking up and it's starting to get a little windy. Mat and the judges are waiting to make the call. Stay tuned for more updates. Had to ride the bike 4 miles toward Davenport to check my email. Stopped and asked a survey crew if they knew were the nearest cell tower was. Said it's a ways toward Santa Cruz but there would be service soon. Funny they were working for Verizon. Crazy road 28 miles on the Felt AR1 looking for cell service. The word is 4 miles south and 10 miles North for cell coverage. Bernd Roediger and a couple of others got out on the Stand Up Paddle Boards. Lots of guys gave it a try with the sails. In the end not enough wind for the first day but would have been a grood SUP day. We have that option at Pistol with the Standup Showdown. The good news is that I've been told it looks better tomorrow. It blew all night and at 7:30 it's already blowing harder than yesterday. Look for the contest to go after the 11:00 judjes meeting. Hopefully I will have found a way to upload the changes. 4 miles to the internet and the outside world. Less than a month until the American Windsurfing Tour kicks of its first contest at Waddell Beach California. Waddell Beach is part of Big Basin Redwood State park and is about halfway between Half Moon Bay and Santa Cruz. 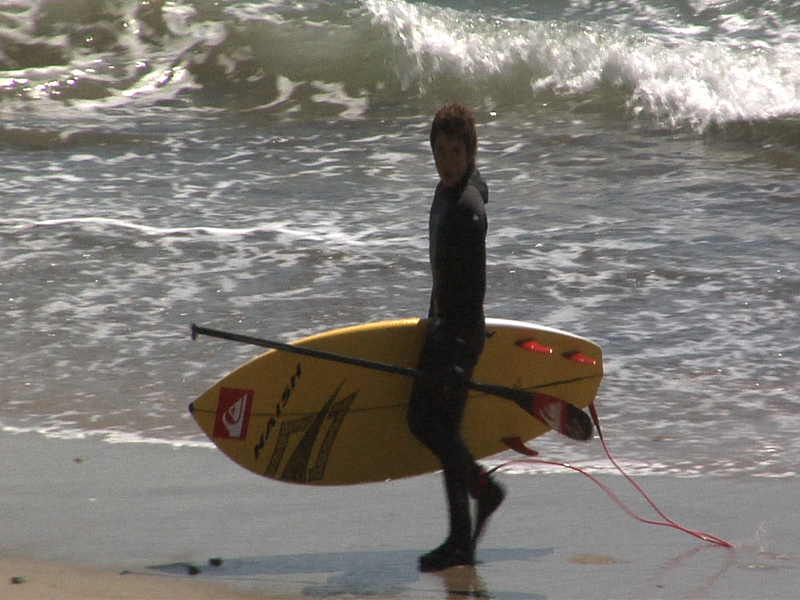 When I was down shooting the Paddle Fest in Santa Cruz I shot some footage of the contest staging area. I posted the Stand Up Paddle video "Victory at Sea" here because you just don't see see surfing contest held in windsurfing conditions. The area that will designated for the contest is the North 75 feet of the parking lot from Highway 1 to the riprap. I got to thinking that even though the video of the Wave Bash finals has been a hit that I might have lost some of you guys with the full version. I went back and pulled out the jumps and the good waves to jack up everyone for this years event that is only a couple of months away. For our surf reportgo to the source GoldBeachWeather.com. Look for a Stand Up Paddle Event this year at the Pistol River Wave Bash in Gold Beach Oregon June 16th through the 19th! The Inn of the Beachcomber has order 10 Naish and Starboard SUPs for a new rental fleet. Check out the SUP Rental link in the nave bar. The Stand Up Showdown is a go at Pistol and I am paying $750 to the Champion, $500 to the runner up and $250 for third so come on down and rip it on your Stand Up Paddle Board. Got off the phone with Charlie Burwell at Pacific Boardsport the Naish board distributer and Naish is committed to bring down some demo boards and jump start the contest. The plan is for Naish and Starboard to demo some boards and for the Inn of the Beachcomber to provide our new rental fleet for the contest. I have a confirmation from Stand Up Paddle World Tour Champion Kai Lenny that he will be my guest at the Beachcomber along with Zane Schweitzer. That's half of the finals from the Stand Up Paddle World Tour's February contest at Sunset Beach. When I was over is Maui Sam and I cooked up a great plan for those that are on the fence for the 2011 Pistol River Wave Bash. Here it is. If you book by April 15th and have paid up your entry for the 2011 Pistol River Wave Bash we will give you a ocean view room for $55.00. That a huge discount from the regular rate of $99.00. So get off the fence and enter then call and reserve a room. A word of caution I have already booked a quarter of the rooms already for Sam, the Judges and the rest of the crew that did such a awesome job last year. My goal is to be 100% Wave Bash for that week and I am planning my own bash with the locals and Sam's crew Tuesday evening June 14th so if you love a good time send off the entry.. If you are a windsurfer come on down to Gold Beach and stay at the Beachcomber. Call the front desk and tell them what you can pay and if we have rooms open we will give you a killer deal. Of course this only applies to those with good energy. Check out the host hotel for the Pistol River Wave Bash The Inn of the Beachcomber! Had a great time in Maui but was a little bummed it was not that windy. 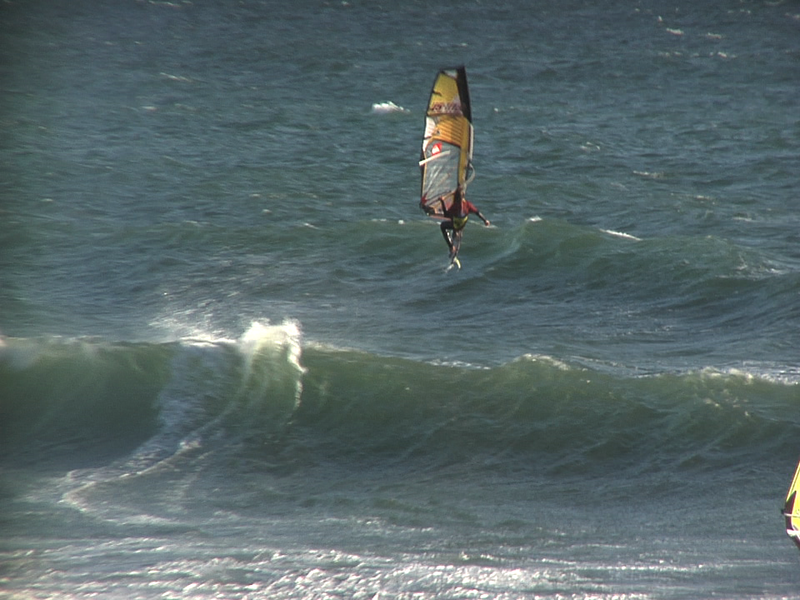 When I went out to Hookipa to film February 8th. 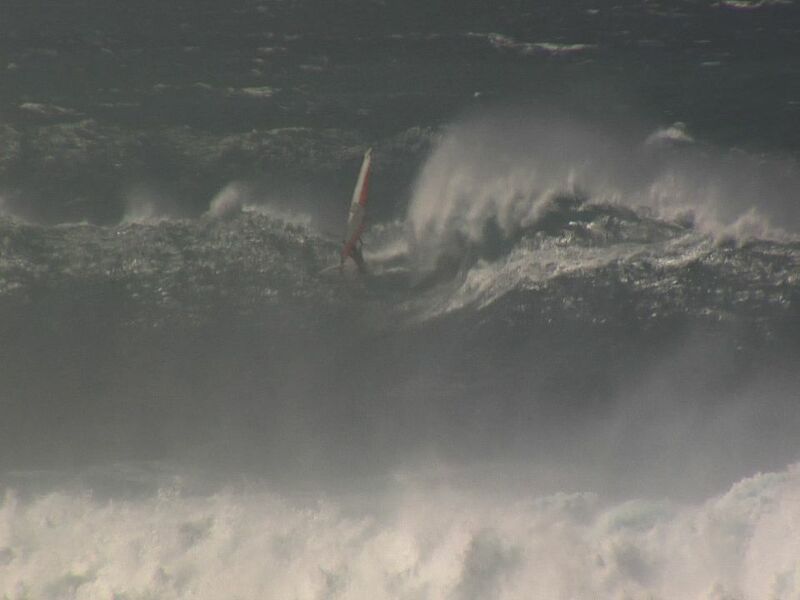 Hookipa was a bit closed out but huge with OK wind. I got some great footage and then Sam Bittner called and said there were some guys out at jaws. Headed up there and was super stoked to see four guys. Stayed there until they headed back on the jet skis. I also have some footage of Zane, KP, Russ, Diego and some others on the west side January 31st. It was a little flat but what a great lineup. After all the time on the North Shore this winter it was a treat knowing who I was filming. Kudos to Zane and making the Pro Finals at Sunset on his Starboard SUP. I was in Maui in February when Linda called me and said some woman named Sam was putting on a wave sailing competition at The Rock. A quick call and I was meeting the lovely Sam Bittner at her Yurt in Haiku and giving her a check to have my property, Inn of the Beachcomber, help sponsor the event. I had spent a fair amount of time on the North Shore of Oahu filming the 25th Anniversary of the Eddie and the Billabong Pipeline Masters and was super stoked to get to shoot some video in Oregon. I shot about 500 gigs of HDDVCPRO, basically the complete competition and plan to keep posting video up here and on windsurfingoregon.com. The streaming flash is encoded at a bit rate of 1000kbs. Here is some stuff you won't get anywhere else. Practice day one video was shot from the Toterhome and the dune. It was blowing and the waves were good. 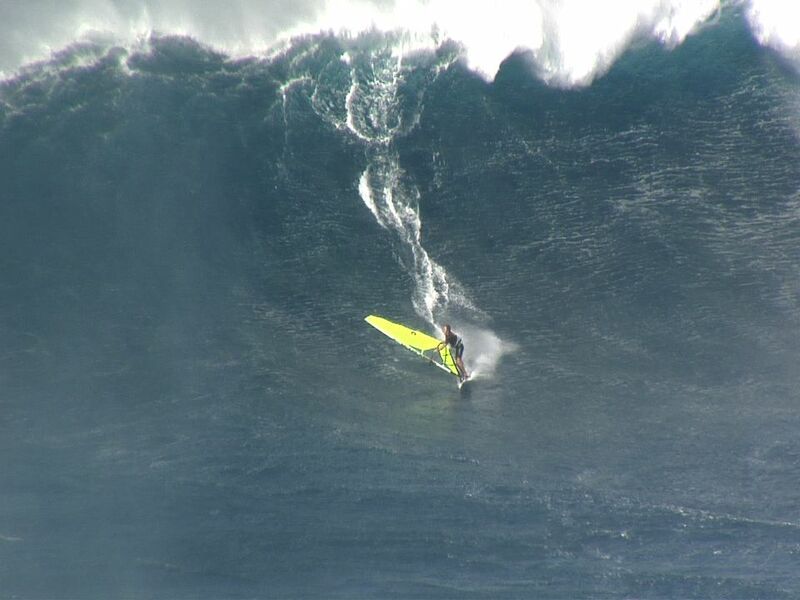 The word from the Maui crew was they needed smaller sails and the waves at the rock just kept coming in strong. It was tough to film with so many people going off but was a great start for me with my new lens and tripod. Ya my music is old school, just like my hat from Maui Tropix but I think it still works. Are you kidding me I got to shoot Robby Naish at The Rock. I think that is sick. Just way over the top for him to come out and support the event. Special thanks of course to local windsurfer Dana Miller for the heads up when Robby Naish headed down to the water. I hope these two make it back this year. I have gone through the files and will get this up soon. They kids are the future of the sport and it is great to see how their parents support their talent. I must admit There is more footage of Bernd than Zane mostly because Bernd stayed at the Beachcomber so I knew his sail when I viewed the footage. After the dust settled on the super finals it was time for the Shadowbox crew to rig the boards with the GoPros and the Shadowboxes. They ran 2 sets and it was a little crazy out there with everyone going off. Not as much air as the Maui event but the waves were smaller. Two twenty minute sets with 7 sailers. Loved the guys falling from the sky. Tyson Poor took the jump off sailing away after a back loop peaking at 30.80 which beat Cisco Goya by 5 inches. What a great way to end the week.